Orbus University, Orbus Exhibit & Display Group’s dealer training program is ideal for tradeshow, sign and promotional industry veterans and newbies. This all-encompassing program is offered each spring, fall and winter, and focuses on Orbus’ display solutions, graphics and sales training. There is no cost to attend and Orbus University is held at Orbus headquarters in Woodridge, IL. Orbus University training sessions combine classroom style learning with hands-on display assembly sessions and educational facility tours. During the two day program, attendees receive extensive training and insight into Orbus’ display manufacturing and production processes. Training will give you a deeper knowledge base of all of what you can sell with Orbus and how we can help you build your business. If you are interested in attending the next Orbus University session, RSVP below. Learn more about Orbus University training, check out the spotlight article in Exhibit City News – simply scroll to pg. 48 to read the story. 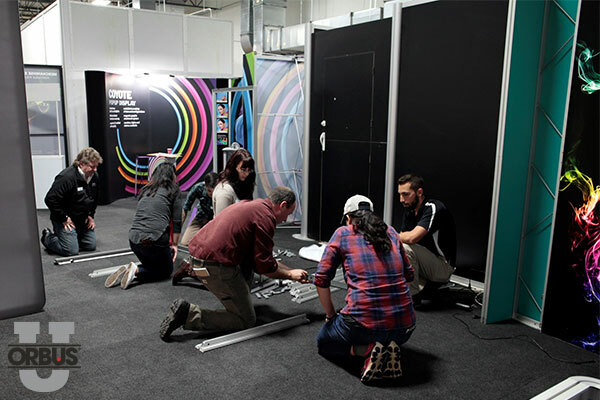 Learn from experts on how to sell a wide range of display solutions - from portable to custom. Learn how companies and industries use display solutions for interiors and events! Our capabilities can help off-set yours if you have them. Learn how partnering with the biggest and best display graphic printer in the USA will build your business. Superior, easy-to-adopt marketing tools and resources make it easy to market and promote what display solutions you offer. Learn what is at your fingertips. Comfortable clothing appropriate for the weather, and closed toed shoes. Training is split between hands-on experiences in Orbus’ warehouse and classroom-style training in the office. There is a room block for each session at the nearby Aloft Bolingbrook hotel. More details are provided after your RSVP is confirmed. Orbus and the Aloft Bolingbrook hotel are centrally located between Chicago’s airports, O’Hare and Midway. Either will provide easy access within approximately 45 minutes. Chicago has several ridesharing companies, including Uber and Lyft. In addition, taxis are available to transport to and from the suburbs. Does Orbus provide transportation to and from the hotel? Yes, on the days of training an Aloft shuttle is arranged to bring attendees to and from Orbus. Any additional transportation is the attendee’s responsibility. Is there parking available at Orbus if I am driving to the event? Yes, there is guest parking at the front of our parking lot. Will food be provided during the day or do we get a break for lunch? Orbus provides a light breakfast and moderate lunch on both days. Dinner is provided on day 1. Attendees are encouraged to use this time for networking and meeting with their Orbus sales representative. Orbus University attendees getting a hands-on experience assembling a light box.